Century leaving IJmuiden in her original livery and under her original name. She is seen her in the outer harbour at the 21st of may 2005. 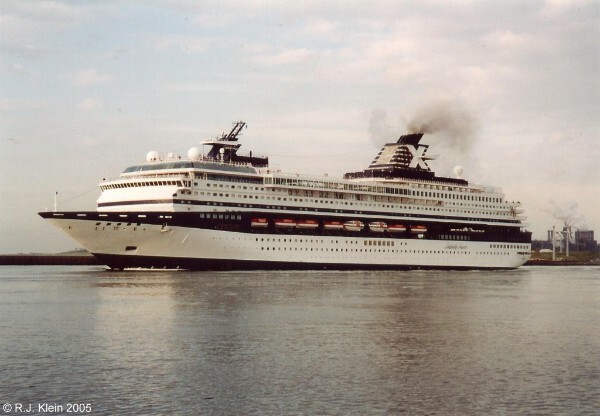 Century was the thirth newbuilding for Celebrity Cruises, following Horizon and Zenith, both smaller ships of around 40.000 GRT. With Century, Celebrity Cruises and thus Chandris started big-ship cruising, although soon after her delivery Chandris sold Celebrity Cruises to Royal Caribbean Cruise Line. In design, the ship was a true follow-up of her earlier fleetmates, but then considerably bigger. With almost 50% more space, she can sail with 25% more passengers, making her public rooms even more spacious then aboard the earlier ships. Century measures 70.606 tons and she has a lenght of 248,52 meters, she is 32,20 meters wide and her draft is 7,50 meters. She can sail with up to 1778 passengers and 858 crewmembers. The passengers can use ten out of her twelve decks The ship is a more classical-looking version of the newer near-sisters Galaxy and Mercury, and she is also more handsome, in my opinion. She floated out on the 2nd of october 1995 from the Jos L. Meyer wharf at Papenburg, Germany where she had been built as yardnumber 637 and was named on the 26th of that month. Her Godmother was Tina Chandris, the wife of the companies chairman John Chandris. Century's positioning-voyage from Southampton to New York started at the 6th of december 1995 and after that, she sailed mostly Caribbean-cruises, but next to those the ship was also seen in Europe in the summermonths later in her carreer. The ship had one industries first, as she was the first cruiseship that was offering a Martini Ice-bar to her passengers. Next to this, she also featured an atrium topped by a dome to bring in natural light, a two-deck Grand Restaurant and a two deck Theater. The main restaurant seats 1080 passengers and was designed by Birch Coffey. It has a marble floor in the entrances and large columns, creating a very classic atmosphere. The Theater has good sightlines and seats 940 and takes its inspiration from planets, stars and the sun. Of course, the ship also offered other placed to dine or grab a snack or drink, next to the usual public rooms found on cruiseships in general. Her interiours, designed by John Bannenberg and John McNeece were stylish, with many woodworks throughout. Because Celebrity Cruises worked together with Sony in the outfitting of the ship, Century was at the time one of the most high-tech ships in the world, with interactive services in the cabins and state of the art audio and visual possibilities in the public rooms. With Celebrity Cruises growing rapidly with the new Millennium-class around 2000, the company sent some ships back to Europe and the Mediterranean to be part of the growth of this market. Celebrity Cruises became a very important player in todays cruise industry in just two decades, not counting their much older Chandris roots. Their ships are high rated and very popular with passengers. Below, Century is shown with her new verandahs added in Amsterdam during the summer of 2006. Because Century had become a little outdated allready by the new Millennium-class ships, Celebrity Cruises updated the just ten year old ship to the Millennium-class standards. During a five-week drydock period in april 2006, the ship got 314 new verandas and also the restaurants and art-gallery were updated. In 2008, Celebrity Cruises added the prefix 'Celebrity' to the names of all their ships for brand-recognition. So Century became Celebrity Century. I do not think the names of the ships became more attractive by this change, but of course, that's just an opinion. At the next picture you can see her with her new name. The year 2014 was the last year that Celebrity Century sailed for Celebrity as she reached twenty in april 2015, the ship left the fleet. In the summer of 2014 it was announced that she would be replacing Zenith in the fleet of Crocieres de France, also part of the Royal Caribbean Cruise Lines. But in september, plans were changed and Celebrity Century was partially sold to the Chinese company CTrip instead for far-eastern cruises from the spring of 2015 onwards. Partially sold, because also RCCL keeps a 35% stake in the new company. In her last season with Celebrity Cruises, the ship hosted several special events and special offers for the passengers. Also, she visited 17 new destinations for the company especially in Asia, like Manila, Brunei and Rangoon. A new company was set up by CTrip for the ship, named SkySea Cruises. Celebrity Century was renamed to what might be the strangest shipname ever, the SkySea Golden Era. Her first cruise under her new name started at the 29th of may 2015 , after she had been upgraded and rebranded at the Sembawang shipyard at Singapore. The SkySea adventure did not last long, as the brand was discontinued from december 2018 onwards. As many of the former, older Celebrity Cruises ships before her, the former Century will be sold to Marella Cruises, the new venture from Louis Cruises. In that fleet, she will take the place of another ship that was supposed to come over, the former Celebrity Mercury and Mein Schiff 2. This ship instead will now stay in the TUI Cruises fleet, so that the 110.000-ton newbuild that was supposed to become the new Mein Schiff 2 will probably recieve a new name.